Go ahead and reach through your screen and grab a lick of that cream cheese filling. Or just drool on your keyboard a bit. A holiday staple in many homes…here is the $5 Dinners version! This delicious treat is worth every.single.step that it takes to create such a masterpiece. Because YUM. Beat eggs on high in a stand mixer for 5 minutes. Slowly add in sugar. Stir in pumpkin. Mix until well blended. Mix dry ingredients together in a separate bowl. Add to batter. Mix thoroughly. If you are adding in the walnuts, then stir them in gently at this time. Pour batter evenly onto the parchment covered baking sheet. Bake 375 degrees for 15-20 minutes until golden brown. 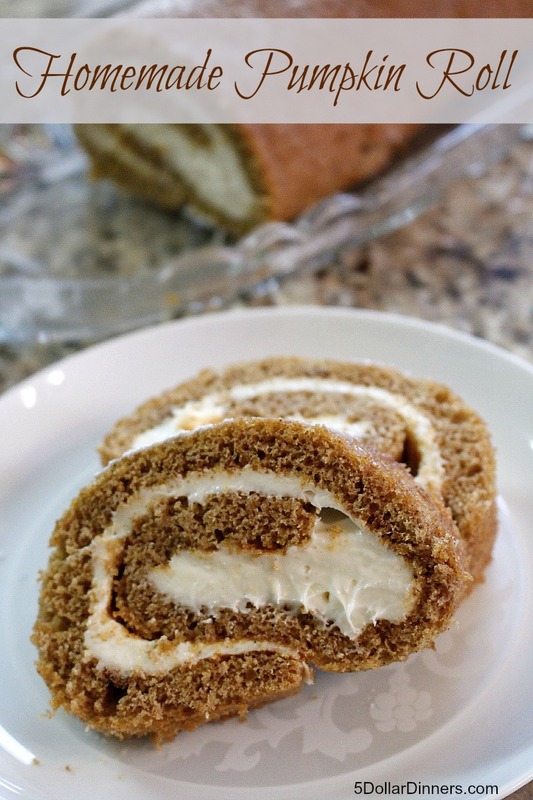 Immediately remove the pumpkin roll from the pan and lay it on a tea towel sprinkled liberally with powdered sugar, parchment side up so you can remove the paper. Carefully remove the parchment paper. 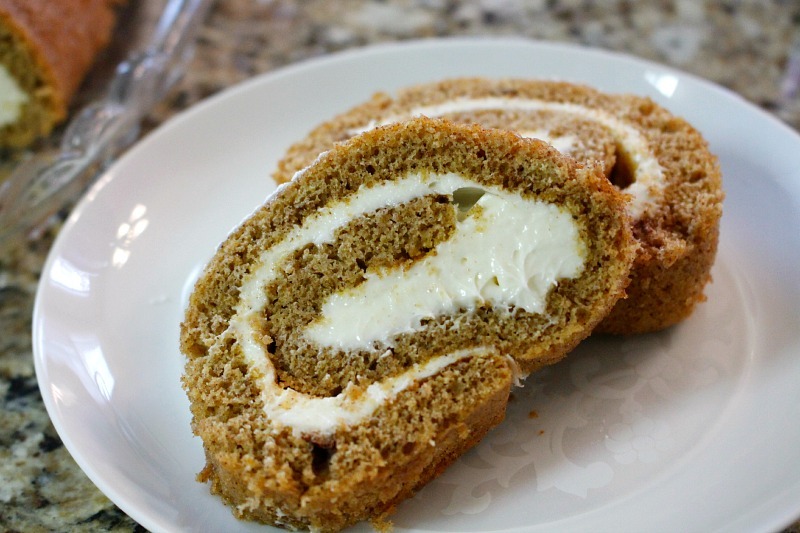 Roll up the hot pumpkin roll in a tea towel to cool. Roll up starting on the short side. The tea towel keeps the pumpkin roll from sticking together. Prepare cream cheese frosting by beating all frosting ingredients in stand mixer until smooth. Gently unroll pumpkin roll once completely cooled leaving it on the towel. Take your time to keep it from cracking. 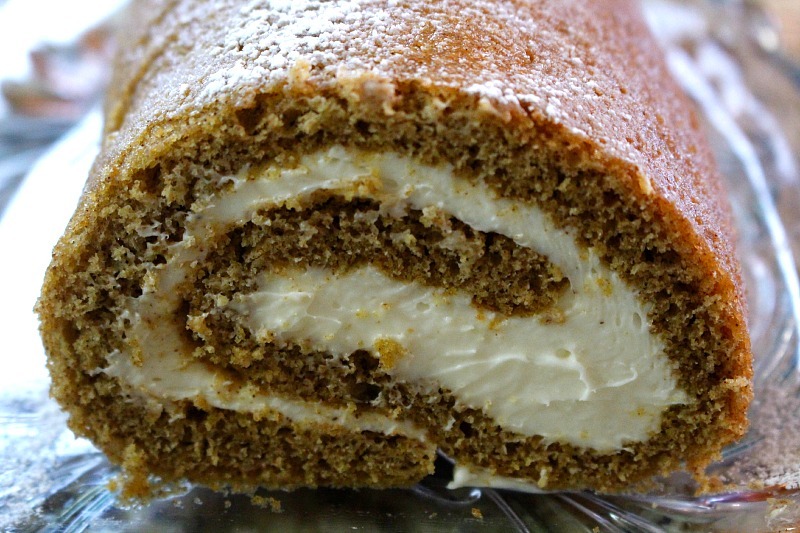 Spread frosting over pumpkin roll. Gently roll back up (without the tea towel) and place on serving platter. Refrigerate until ready to serve. Optional: sprinkle powdered sugar over top of pumpkin roll prior to serving. This recipe is featured on SouthernPlate.com’s Meal Plan Monday #89.